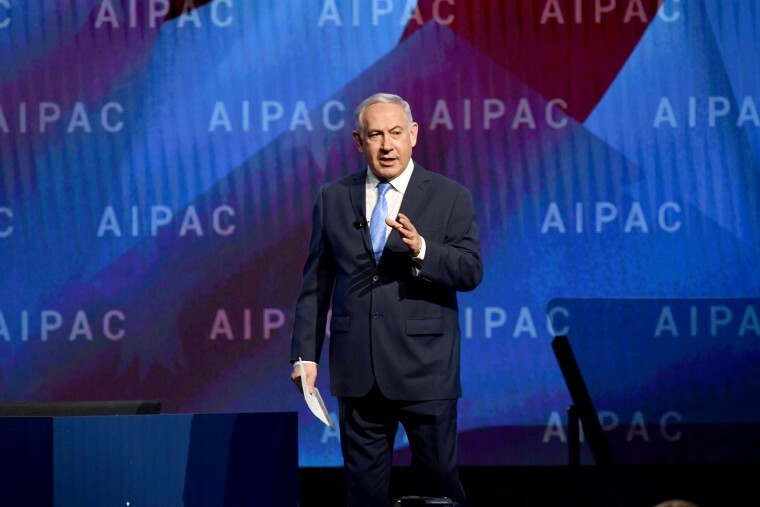 WASHINGTON — Israeli Prime Minister Benjamin Netanyahu on Tuesday urged President Donald Trump to take a tougher line on Iran in a speech at the American Israel Public Affairs Committee's policy conference. “I have a message for you today, it’s a very simple one: We must stop Iran, we will stop Iran," Netanyahu said at the annual event hosted by the pro-Israel lobbying group, which draws top leaders from both parties. "Radical tyranny in Tehran," he said, was expanding its regional influence in Syria, Lebanon and Yemen. Netanyahu’s address came as Trump and Congress are considering their options on the Iranian nuclear deal, which the president decertified in October. Senators, led by Foreign Relations Committee Chairman Bob Corker, R-Tenn., are working on legislation that could reimpose sanctions on Iran if it violate the deal's conditions without abandoning it entirely. Netanyahu, who fiercely opposed the Iran deal negotiated under President Barack Obama, suggested Trump should be willing to scrap the agreement if the conditions could not be toughened. The speech came at a difficult political period for Netanyahu, who has held office since 2009 and is fending off an intensifying corruption probe back home. Vice President Mike Pence on Monday said the administration was willing to exit the Iran deal — which was negotiated with the United Kingdom, France, Germany, Russia, China and the European Union — unless the other parties agreed to changes. Other AIPAC speakers, including Senate Majority Leader Mitch McConnell, R-Ky. and Senate Minority Leader Chuck Schumer, D-N.Y. also used their speeches to take aim at Iran. "We can never be complacent abut any threat near Israel's borders, and Iran is a threat right now," Schumer said. The president of J Street, a nonprofit rival to AIPAC that bills itself as “pro-Israel, pro-peace,” criticized Netanyahu, saying he "offered nothing new or substantive in his speech, only fear-mongering and empty rhetoric."